Hanoi Bella Rosa Hotel is a BRAND NEW LUXURIOUS 3 star hotel just opened in May 2016. 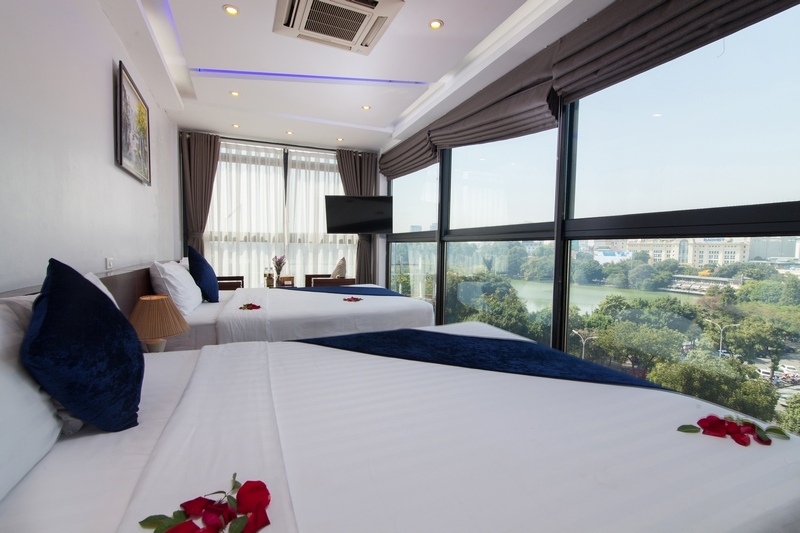 Centrally located in the heart of Hanoi’s historic Old Quarter, this modern boutique hotel offers relaxing living space for the discerning business travelers and holidaymakers alike. It’s a corner of the famous Hoan Kiem Lake and Thang Long Water Puppet Theater along with many shopping, business, and entertainment venues. The hotel presents well-appointed guest rooms featuring a variety of up-to-date facilities, including WIFI with free high-speed Internet access. For first time visitors to Vietnam, the hotel staff is ready to assist with tours and travel arrangements. Other serviced available include foreign currency exchange, airport transfer, and car rental. Hanoi Bella Rosa Hotel is located in the heart of Hanoi Old Quarter, just 100 steps away from the Hoan Kiem Lake – the simple of Hanoi. Super – closed to all of the popular attractions like a water puppet show, shopping streets, historical areas as well as traditional food areas of favorite Hanoi spring rolls and the BEER CORNER, LOCAL STREET FOODS, CAFE. All the rooms at Hanoi Bella Rosa Hotel are super clean, comfortable and spacious with modern Lift – easy access to your room. All are private ensuites with private bathrooms or bathtub with strong hot/cold water pressure good A/C, new LCD with Wifi internet which is not the only TV with over 94 channels including BBC and CNN, Star Movies and Sport and you can watch Youtube, facebook and so on. Fridge with drinks as well as our special extra of flowers provided daily to your room, Complimentary tea, coffee & one bottle of the mineral per person in room daily. ALL staff working at the Hanoi Bella Rosa Hotel are super friendly and helpful who has been working for TOURISM at least for 5 years so they will assist from the moment you enter into our Hotel ,you will certainly feel like you are a family member – as such, this is the way we treat our guests. Our staff is willing to arrange for you with the best options for choosing beds from singles, doubles, twins, triples, Quadruple. Providing information for all kinds of tours that meet many styles and budgets for every traveler is easy !!! Please just feel free to ask our helpful staff at reception with 24 hours services. Our keen on is the Halong Bay, Bai Tu Long cruise, Daily tours, Sapa Tours by bus or train, flight ticket booking, open bus ticket, visa extension .etc.., We are very happy to arrange some others great day trips and excursions around Hanoi and to the surrounding villages for you. After 18 years working in the hospitality industry as chefs, receptionists and tour guides for millions of travelers who visited Viet Nam, Mrs. Sunny & Mr. Tony Dinh (Founding owners of VBA Group) really want to serve the tourists all over the world with their burning. So they decided to open firstly a mini hotel with 16 guest rooms in the Hanoi’s Old Quarter names B&B Hanoi Hotel. This is a story of how the founding owners Mrs. Sunny & Mr. Tony (They are now husband & wife), and their team, aspired to build a highly professional boutique hotel group founded on exceptional customer service. They were both born in a poor working-class family on poor provinces of Vietnam, were financially unable to pursue their dream of becoming doctors. They instead went to teacher training college, funding their studies by working every available hour doing jobs such as chefs, tour guides, mini-hotel receptionists. Then fate intervened when they landed both receptionist job in a 3-star hotel in Hanoi. The next few years gave invaluable insight into hotel management, HR, guests’ expectations and customer service. A plan formed in their mind. Taking the plunge at the beginning of 2013, They invested all their savings in a small 16 room mini hotel in Hanoi’s Old Quarter. They ran this with 10 staff (who are still with them today). At the time, Hanoi’s Old Quarter hotel industry was a competitive “jungle”. Quality, customer service and putting the guest first were not priorities for most hoteliers. Many just wanted to make money by any means possible. They rose above this. Good customer service and high standards would define and differentiate their business. The ethos right from the start was, and continues to be, to focus on every single detail, to care for every guest, to exceed expectations and to build a team of genuinely friendly professional staff with the “guest comes first” vision. The early days were very challenging, made harder because of limited financial investment. Plus this very young team was trying hard to introduce a new concept into Hanoi’s competitive hotel market. Their passion, open-minded approach and an unfailing determination to succeed paid off. Working 24/7 VBAG’s foundations were laid as the team set a new trend for Hanoi’s mini hotel market section. The team upscaled and started to develop a brand identity in the first decade of 2010, which would differentiate their hotels from others. This was the VBA brand - the forerunner of today’s Babylon Hotel Group. From 2018, the business went to the next level. Some of the older hotels closed in order to refocus investment on an expanded vision. In early 2018, the group’s first four-star styled hotel opened in the middle of Hanoi’s Old Quarter. This signifies a higher level of service offering featuring more luxurious accommodation and spa. VBAG’s goal is to consistently give every guest an outstanding personal service focusing on sophistication, luxury, and great memories. Dedication, passion and hard work by this hotel family have made VBAG one of today’s most respected mini hotel groups in Vietnam. With a reputation for impeccable quality and a five-star ethos, we invite you to come and experience our unrivaled service. Our journey continues and so will our story! NOTE:W e are just on the side of Hoan Kiem Lake, at 21 Cau Go Str, Hoan Kiem / center of the Hanoi old quarter city, Hanoi. So if any of tour try to take you to others for commission. Please insist on getting into our hotel and meet our Manager, Mrs. Anna, Ms. Daisy or Lucia for help! Thank you and wishing you have a wonderful memorial holiday in Hanoi and our hotel! Management & Team are welcome You!